An artist's conception of the Mars Express craft with the MARSIS antenna in place. PARIS -- A radar boom antenna aboardEurope's Mars Express satellite that had failed to lock into place wassuccessfully deployed May 10-11 after ground controllers maneuvered thesatellite to expose the boom to the sun, according to the European Space Agency(ESA) and European scientists. The successful operation makes it more likely that ESA willauthorize deployment of the second 20-meter-long boom in the coming weeksfollowing an investigation into the first boom's problem. The non-deployment of the antenna had so worried Europeanscience managers that they declined to authorize a two-year extension of theMars Express mission during a May 9-10 meeting of Europe's Science ProgramCommittee (SPC). Risto Pellinen, chairman of the SPC, said May 12 that theSPC probably would have authorized the two-year extension, to December 2007, ifthe balky radar antenna had been successfully deployed before the SPC meetingin Helsinki, Finland. The two-year extension has been budgeted at 15.6 millioneuros ($20.3 million). Pellinen said the SPC is scheduled to meet next in Septemberand is all but certain to agree to the Mars Express mission extension --assuming the second radar boom is successfully deployed by then. The SPC hadfeared that Mars Express' other instruments might be unable to function fullybecause of the disequilibrium caused by flying with a single, partiallydeployed 20-meter antenna, Pellinen said. Working with NASA's Jet Propulsion Laboratory, whichsupplied the radar antenna, Mars Express program managers concluded that thelonger-than-expected storage of the boom might account for the fact that one ofits 13 joints, or hinges, failed to lock into place during the May 8deployment. ESA said in a May 11 statement that the Kevlar andfiberglass boom material might have been affected by the prolonged storage atcold temperatures. Mars Express reached Mars orbit in December 2003. Its radarantennas were not immediately deployed because of concerns that there might beof a whiplash effect created by unfurling the two 20-meter antennas. 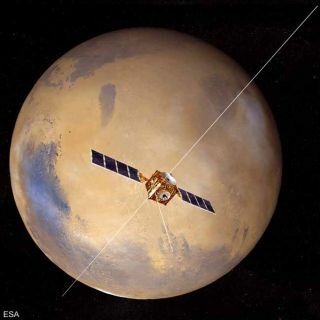 Thatconcern did not surface until after the satellite had been launched and once itreached Mars ESA officials wanted to give the satellite's other instrumentstime to operate before running the risk of damaging them during the radardeployment. Moving the satellite to fully expose its non-deployedelement to the sun apparently worked by heating the affected joint and allowingit to lock into place. The radar antennas are designed to search for water upto a depth of several kilometers beneath the surface of mars.